Music ensemble This Way to the Egress will celebrate Halloween not with a concert, but with something a little more macabre. Tonight, the group will second host their free walk-through “Home Haunt,” which will be open rain or shine from 6 to 9 p.m. The house is located at the corner of Drury Lane and Country Place in Bethlehem. This Way to the Egress accordionist Taylor Galassi said during a Thursday evening phone interview he and his 26-member crew are pulling out all of the stops — and then some — for this year’s attraction. The home, which typically serves as the band’s rehearsal space, will feature 13 “rooms” with varying themes, ranging from a twisted funhouse to a sinister psychiatric ward. Naturally, this evening’s soundtrack will be peppered with songs from This Way to the Egress’ catalog. But Galassi said fans will really have to keep their ears attuned to the music to spot them — when they’re not being distracted by one of the many ghosts, goblins or stilt-walkers waiting around the corner. The group’s mission, Galassi said, is to make sure those who enter walk away with a fun and satisfyingly spooky experience. Inspired by a lifelong fascination with horror movies and old-school haunted houses, Galassi and his bandmates launched their first haunted house in 2016. He said about 200 people showed up that year. “The neighborhood in this town really accepted us; everyone’s really warmed to us and we wanted to give back,” he said. 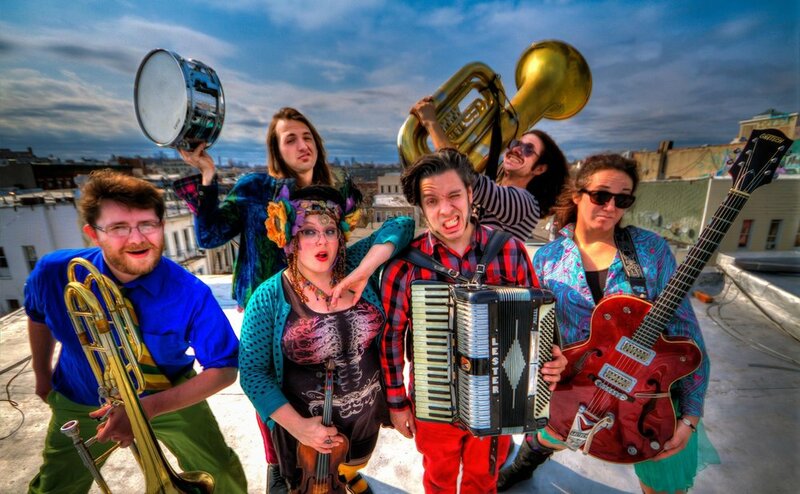 Since their formation in November 2008, This Way to the Egress has developed a cult following thanks to their pleasingly peculiar blend of cabaret, calypso, and roots music — a vintage sound with a modern gothic flair. The band has released four albums, their most recent being 2017’s Onward Up a Frightening Creek. “What I enjoy the most are those fans who show up and know all the words to the music. It makes me feel like I’m doing something that’s worth it,” Galassi said.